I have never been one for small cars personally; I never have, and never will own one. It’s not that I underestimate the importance they play in the current financial, and lest we forget “Eco Crazy” motoring world we now inhabit, far from it, you can’t walk along any self respecting High Street nowadays without your senses being assaulted by the sheer number of “Smart” cars or “G Wiz’s” (Yuk! & double Yuk!) 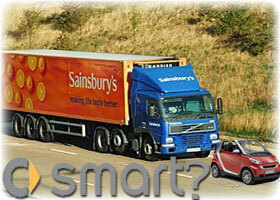 or the much rarer (but not for long) and much “cleverer” Toyota iQ. But still very, very small and very, very boring, to drive anyway, and that’s before we get to the issue that’s not very Green and not very fashionable, but to me and my family paramount above all else, safety. Yes, I know, there’s a quirky little advert currently on television where a crane swings a demolition ball into the front of a “Smart” Car and the site foreman gets out and walks away scratching his head, not a mark on him, completely fine. This just goes to show how safe you will be in a “Smart” car the next time you inadvertently drive into a concrete demolition ball! Which let’s face it, happens all the time in the real world doesn’t it? Funny that, because it was the complete opposite of that word I felt in an estate agent friends Smart car overtaking an articulated twenty wheel lorry in the rain at 70mph on the M4 the other night. We didn’t crash, but for a split second I thought of that advert, then I came to my senses and thought about me. Small cars are here to stay, tiny ones probably more so. They can be cheap to buy new (and let’s not pretend, in some cases very expensive) they increasingly have all the features you find on larger models, they are frugal in the extreme with regards fuel consumption, you don’t have to pay the congestion charge and on some models even the road tax is Free! Thats a big incentive and when I look at my own car I’m happy to say it at least has one of those incentives, its BIG. Twenty to the Gallon (sorry, Litres!) £210 Road Tax, £500 or more a year to insure, above average servicing costs, and I can’t even park it very easily. Big is beautiful? Times have changed, the sooner people like you in your Chelsea tractors get off the road the better. Face it, manufacturers will not be making the cars you declare your love for in 20 years so you’ll just have to get used to it. Small is the future! Andreas why are you making anti car statements on a website for the motor trade? Do you really think this is going to promote your cause? Maybe try Greenpeace.org?